Fantasy sports are officially mainstream. The good people at Fast Company have dropped a tremendous info-graphic on the impact fantasy sports have on the North American economy. See it here! 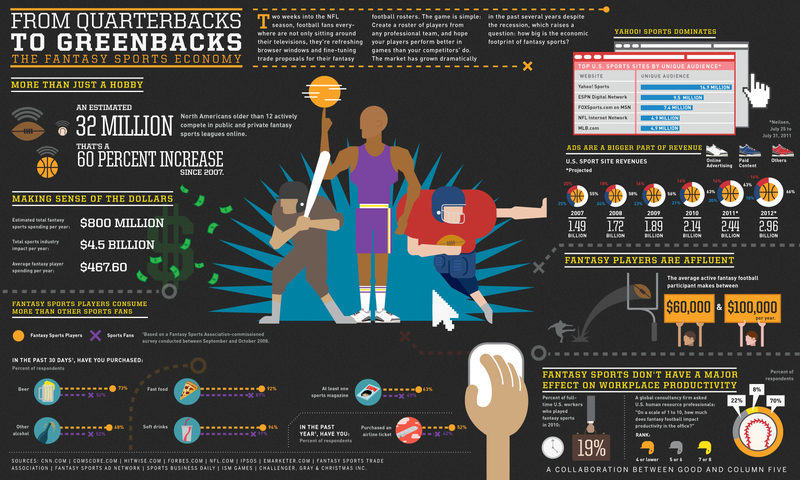 We’re going to show you the numbers, but first we’ll give you a heads up on the basics of fantasy sports – just in case you’re not already obsessed. Players draft a team of professional players in the sport of their choosing. They get points based on their players’ on-field performance (in a wide variety of stat categories). Highest point total wins the day/week/league – there is often a financial buy in and pay out for these leagues and matchups. Also, it’s just another excuse for me and my friends to talk smack, track stats and obsess over every play of every game. Sure, it’s pointless… but it’s a lot of fun. That’s 18% of the entire sports industry! So I think we can safely say that fantasy sports are no longer a fad – it’s huge business and it’s going to shape the way sports are covered and consumed. If you want to keep up, it’s a good idea to look into the ‘craze’ and get up to speed. What fantasy sports have you gotten in to? Let us know in the comments! *The numbers for this report were based on research by Comscore, Hitwise, CNN, Forbes.